I've discovered that it's very difficult for a mom to have a sick day. The family still needs to be dressed, fed, laundry still piles up and let's not mention the dirty dishes overtaking the kitchen sink! Alas, I was forced to take a sick day today. Thankfully, it was Saturday so Daddy was home to help with the kids. Thankfully, we had nothing on the calendar except I was hoping to go do a family outing. I'm trying to be thankful for another 4-5 inches of snow which kept everyone inside...but wouldn't spring be nice, too? And what manner of vile ailment rendered this mom incapable?? It's true, not the flu, not a sinus infection like my spouse and not an ear infection like my daughter. I have a cold. 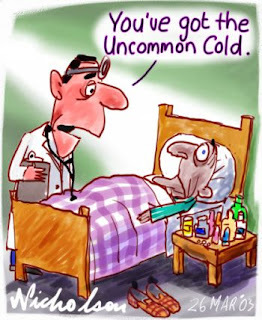 Seems so wrong to feel so bad with the common cold. The current strain making its way around the schools and into our home is one with sinus pressure, a low grade fever that causes huge shifts from fever to chills, and it wipes you out. I had some accompanying body aches. I slept in until 8:30, went back to bed at 10:15 for a nap. Managed to get up at 12:30 and help feed the family lunch--corn dog or chicken nuggets, pick one! I was freezing with chills so went to bed to warm up and read until 2:00. Then I took another nap until 5:30. From there, I managed to stay awake until after 10:30. Just don't take note of the fact I spent most of that time in bed watching TV or reading. I was just too pooped to move. 1. Children can survive on snack foods for one day. 2. Who needs to get everyone dressed if you're not really going anywhere? 3. Daddy is capable of ordering pizza for dinner. 5. We mothers need to relax a little more and let some things ride. 6. Dishes piled in the sink make the most inventive works of modern art. Embrace the art, ignore the mess. 7. After a large sigh, admit that you'll spend the entire day Monday trying to do damage control and picking up the 10,000 toys littering the floor. 8. When the day seems to overwhelming, go back to bed! Praying your family won't incur any mommy sick days. But if you do, take time to slow down and do your best to enjoy the ride. Free Photos TODAY (Fri.) ONLY!! Did I mention the ears? Like TGIFriday's? How about Buy One Get One?